An Accolade® PVC Weather Screen is a solid aluminium frame inserted with a clear, weather resistant PVC material. The PVC is stretched and held taut between all corners of the frame during the manufacturing process. They are a stylish an innovate alternative to traditional PVC Café Blinds, Bistro Blinds and PVC track guided systems. First designed in 1999, Accolade® Screens have become the market leader in outdoor enclosures and have helped transform more that 15,000 homes Australia wide. Whether it is a decking, alfresco area, pergola, sunroom, carport or outdoor area, the team at Accolade® can design a tailored package to suit your requirement. Obviously through our no-obligation and one-on-one consultation. In addition to the weather-proofing characteristics of our PVC screens, installing one of our systems will improve the thermal properties of your outdoor area, allowing a warmer outdoor area to be maintained as well as reducing noise by up to 30%. Our PVC Weather Screens are designed with strength and stability in mind, particularly for areas prone to high winds. 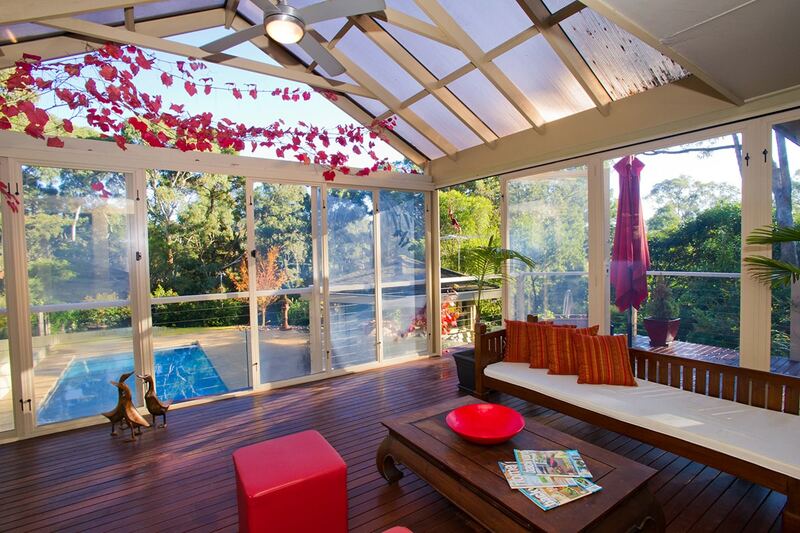 Overall it is safer and lighter than glass and they allow you to maintain an open or closed outdoor area. Rather than using pulleys, ropes, or crank systems that you would associate with PVC Bistro and PVC Café Blind systems. Our systems can span opening greater than 10 metres wide without the need of permanent posts and are not prone to below issues associated with PVC Blinds. Each Accolade® PVC Weather Screen is engineered and designed with a custom 80mm wide aluminium extrusion frame. Coupled with an internal stainless steel locking pin system. The simplicity of the design allows your outdoor area to be opened and closed with minimal fuss. Accolades unique tracking system is backed by a life-time guarantee and will never rust, seize or corrode in an outdoor environment. Equally in one that is subjected to the extremities of the Australian climate. Most home owners are restricted to utilising their outdoor area all year round due to poor weather conditions. Together with birds, dust and noise are also common problems that an Accolade® PVC Weather Screen system can overcome. In addition to the weather-proofing aspect of our PVC weather screens, installing one of our systems will improve the thermal properties of your outdoor area significantly. To find out more about our Accolade® PVC Weather Screen system, please click on our galleries, view our informative videos or contact us today to organise a free no obligation measure quote.